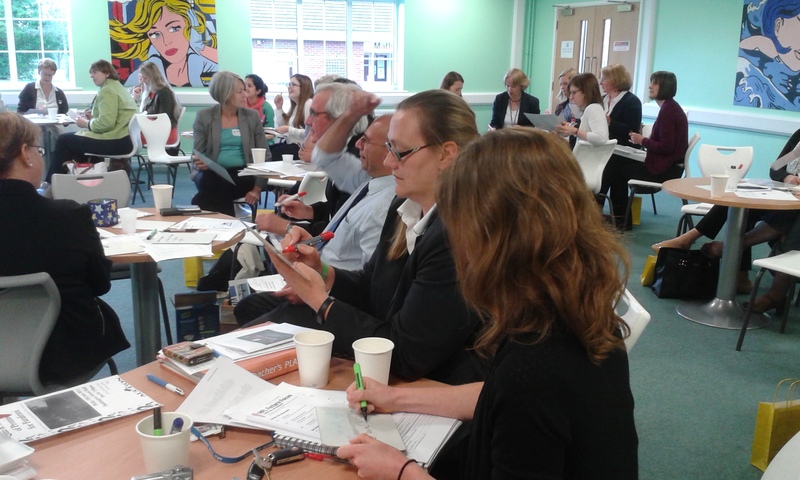 There was a huge response in school to the first Teaching and Learning Challenge video, with many a break time conversation revolving around what pictures staff were using in their lessons. Below are a very small sample of the ideas used in challenge week. 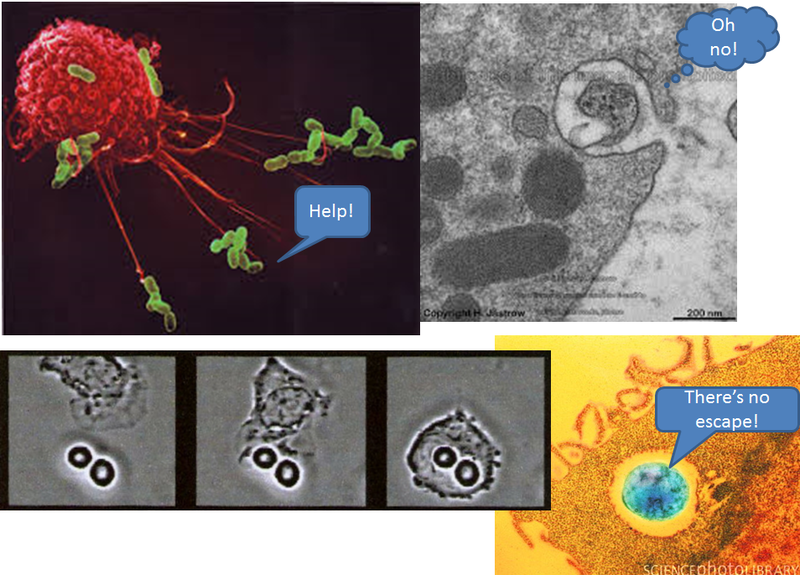 I used a photo in AS Mechanics to indicate the difference between real life and what we use in a mathematical model. So I had a photo of a skip (the example was about the forces involved in pushing a skip along the ground) with all its detail next to my model, which was a very simple box drawn in marker with some arrows indicating the forces. It made them laugh, anyway! I used different images of ‘bodies’ (from Pompeii/mummies) as a starter to see how students responded (emotional/Quality Question/etc). Using their post-it feedback we then had a discussion about what should happen to these sort of exhibits. We then debated what should have happened to Mel’s body in the play ‘Bog Child’. I showed pupils a picture of a football pitch and asked them to come up with mathematical questions they could ask about the picture. 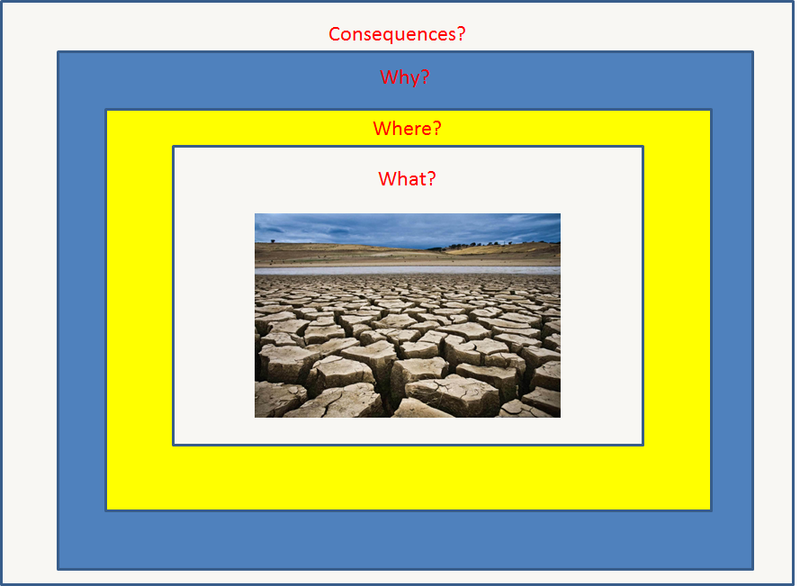 Once we had a range of questions generated from the class (what is the perimeter of the touchline? What is the area of the box? 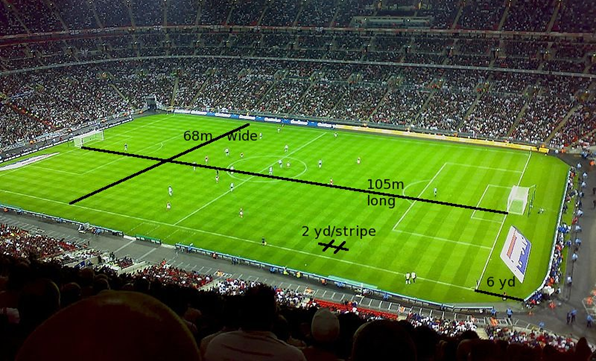 What is the maximum area a football pitch can be? What is the circumference of the circle? Etc), I gave them some numbers and measurements so that they could answer the questions. We had been looking at written methods of calculation, so there was lots of opportunity to practise their skills. (Power point with measurements here). With Yr 12 we had been reading and studying the Keats’ poem “La Belle Dame sans Merci”, so I found a more unusual picture of the poem – there are many artistic representations of Keats’ work – and asked them to explain how the image represented the poem, but also why it was unusual and what ideas it brought out of the poem because of the visual focus. We then had a class discussion and I asked them to start linking quotations, as well as their own ideas and interpretations, to the picture. Thanks to everyone who got involved in the challenge. 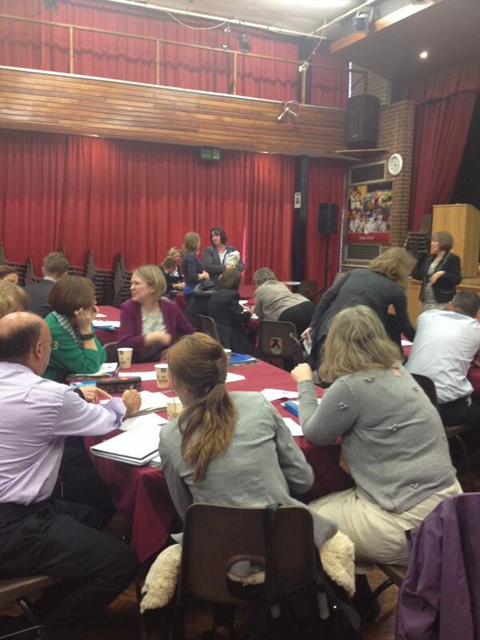 Get ready for the second T&L video challenge week coming soon. 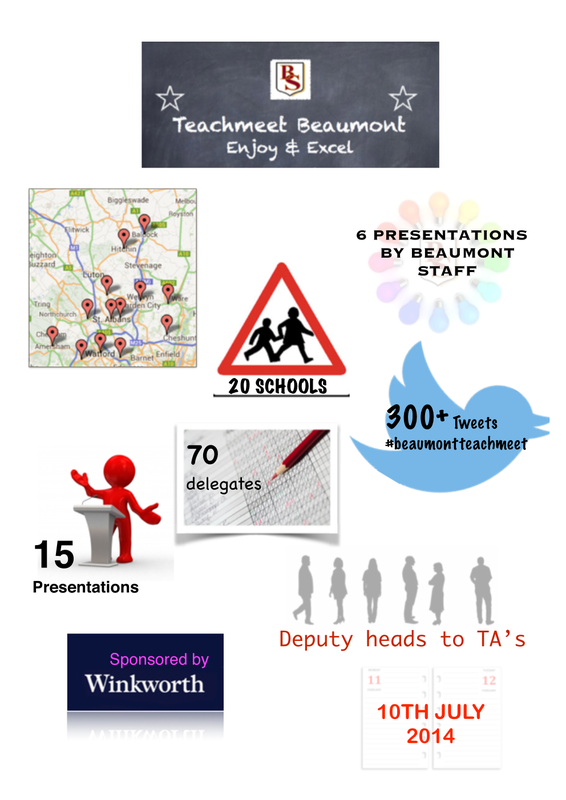 The 2013 TeachMeet at Beaumont School, run by the T&L team, led by Jo Cavanagh, was incredibly successful in giving an opportunity for classroom teachers, teaching assistants, deputy heads and senior teachers to come together and talk about Teaching and Learning. It may have been a dark rainy evening in November, but the enthusiasm of all present meant that everyone left with a spring in their step, keen to try something new on the following Monday morning. 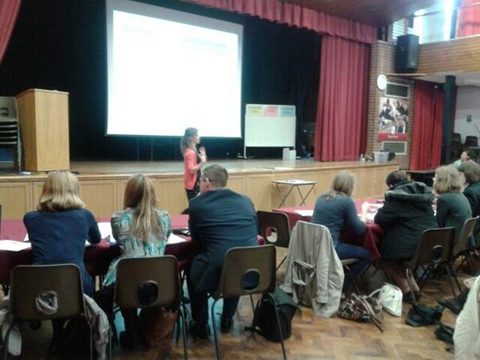 Jo Cavanagh has spoken at another TeachMeet explaining how we approached the event and why we felt it was important. See the video from the event, and previous posts to understand why we are keen to do it all again. 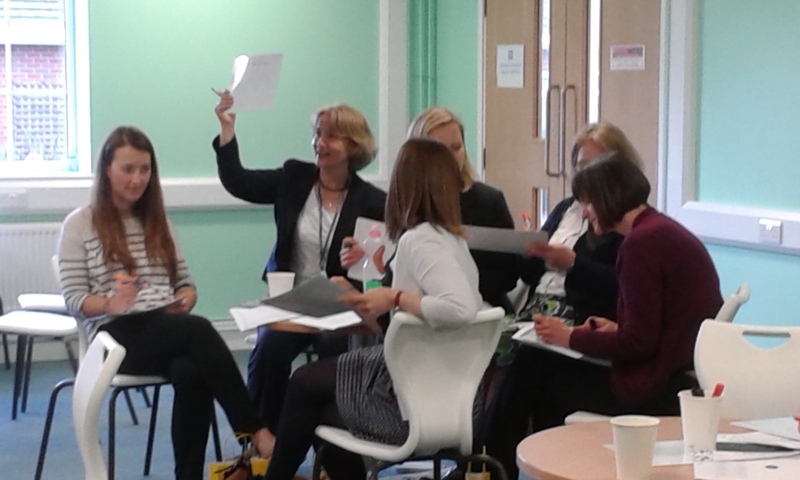 Planning for our next TeachMeet is underway. Put Thursday 10 July 2014 in your diary for an evening of chat, sharing, networking, and the best CPD you will get this year.